Released alongside the latest audio drama box set, Restoration Part One, Christopher Cooper’s Uprising is a novel set in the early part of Series B. While the audio dramas may be hemmed into a sweet spot of continuity, no such restrictions hamper prose and so the story takes place between the episodes Shadow and Weapon, and features the full, original line-up of Blake, Vila, Avon, Jenna, Gan, Cally and Orac on board the Liberator, with the relentless Space Commander Travis on their trail. 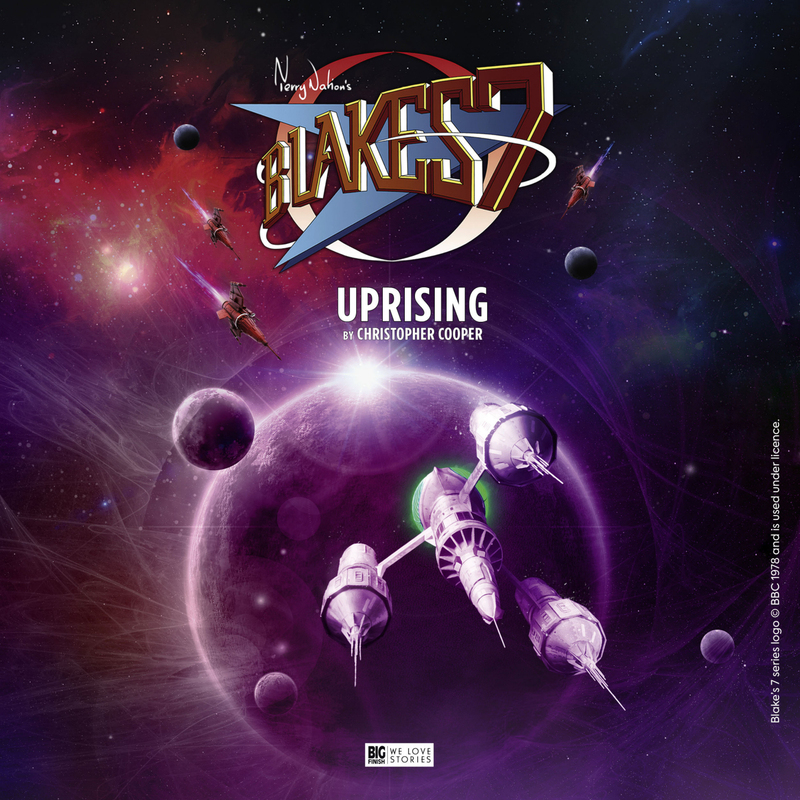 Uprising begins with Blake desperate for a win; after a run of bad luck, he is conscious that they have had some lucky escapes but have failed to make a grand impact. Meticulously planned with the aid of Orac, his latest scheme seeks to strike at the belly of the beast, disrupting food production by supporting a rebel group on Istria, the so-called “bread basket of the Federation”. Much has been written about the character of Gan, the giant of a man whose most violent impulses were restrained by an implant, and whose death five episodes into the second series left the character ripe for further exploration. Indeed, the Australian Blake’s 7 podcast Space Fall, who are reviewing the show on an episodic basis (and which I heartily recommend), have a regular “Gan Watch” feature to chart his diminishing role as the series progresses. As much as this is anyone’s story, Uprising belongs to Gan. While he was so often relegated to thuggish moments and supporting lines on screen, writer Christopher Cooper takes Gan as one of his leads, alongside Blake and Travis, and we sympathise with the big man as he is granted a romantic dynamic in amongst the thrills and spills of a full-bloodied adventure tale. He also makes time to consider Gan’s murderous past and his motivation for staying with Blake. Christopher Cooper, who has multiple Big Finish credits including Blake’s 7 and Torchwood, demonstrates a good understanding of the crew and a love for this universe. From beautiful descriptions of the Liberator, to Cally’s cautious empathy and Jenna’s quiet support of Blake on the eve of the mission, he grants each of our heroes a time to shine. There is an intense train jump sequence early on which really stands out, as well as an all-out space battle with an unlikely pilot at the controls of the Liberator – moments we can easily imagine might have formed part of a lost Blake’s 7 holiday special, albeit with an astronomical budget! The vivid descriptions of Istria paint the picture of a planet utterly given over to food distribution, inhabited by dehumanised workers who are all but slaves to the Federation. This theme of dehumanisation continues throughout the book and while Gan learns about Jade’s disturbing past, we are provoked to consider the scale of the Federation and its grip on the lives and deaths of its citizens. At the end of the story, the author leaves us in no doubt whatsoever about the validity of Blake’s crusade. For the audiobook version, Stephen Greif is on narration duties and he is an ideal choice given the story features plenty of Travis. We get inside the Space Commander’s mind as he investigates, trusting his instincts to lead him to Blake, and we also gain another perspective thanks to an old rivalry with a fellow officer. The story also manages the neat trick of providing an in-universe explanation for the transition of actors in the role of Travis between series, which is just the sort of fan service I love. Grief goes lightly on character’s voices, providing a flavour of the original rather than an impersonation, and captures some of the crew brilliantly, patricianly with his delivery of Avon’s wry one-liners – of which there are plenty. In an Extra, he also answers some fan questions, and reveals that he is not fully aware of Travis’s onscreen fate having not watched the show after he left, save for a few clips. He did have a few ideas about how he might have taken the character further though and comes up with a believable casting suggestion were the show to be rebooted today. Just to have one minor grumble, I do find the cover art rather generic. While it is a fine rendering of the Liberator, chased by Federation pursuit ships, it is incredibly close to the picture which graced the cover of the previous release, Heroes. Uprising is available from Big Finish as an audiobook, as well as in physical and eBook formats. In the long months until Restoration continues, this is a wonderful way to spend some time with the early Liberator crew, and a gripping, thought-provoking tale to boot!